Fancy pantsuits, designer dresses, accessories, beauty makeovers and such. The self-proclaimed hockey mom is in the uncomfortable position of having to explain the $150,000 bill she rang up for shopping trips, hairstyling and beauty makeovers since boarding the McCain for President campaign bandwagon two months ago. Politico.com made the revelation yesterday. 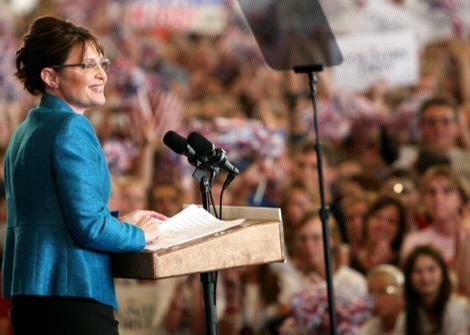 The Republican National Committee is paying the tab, but the contradiction (Palin’s makeover tab is more than the $125,000 she earns as governor of Alaska) makes me wonder if the GOP, McCain and Palin have any grasp on the fashion reality that exists for most Americans. “It’s smart for a candidate to polish her image before stepping onto the national stage,” wrote Robin Gihvan in today’s Washington Post. Unlike a man, a woman can’t easily get away with a wardrobe of a half-dozen virtually indistinguishable suits, a gross of red or blue ties and a suitcase full of white dress shirts. A woman’s wardrobe will cost more, and putting it together will be more time-consuming. But it should also be one that reflects the person, her demographic and her message. And it’s always nice if she actually buys it herself,” wrote Givhan. When I anchored the news in Detroit in the early 1990’s, tailored suits and silk ties were expected in my wardrobe. I received a $2,000 clothing allowance each year. I paid taxes on the tradeout management had made with some of the TV station’s clothing advertisers. In other words, I paid full price. No discount. It wasn’t donated by campaign supporters. It was reportable income. Today, I’m a college professor. I knock down about $65,000 a year. My wife works too. She’s on pace to squeeze out $25,000 this year in a down real estate market. We have two teenage daughters. One is in college. The McCoy family wardrobe allowance? About the same $2,000 I received in the early 1990’s. This money though comes directly from the McCoy family budget. I did the inflation adjustment math: That $2,000 from my Detroit days would be worth about $3,600 in 2008. Our entire family is hanging in there in 2008 with $2,000 for clothing and shoes. We’re not complaining. We’re thankful for our jobs. We know times are tight. We’re trying to stay on budget. Most of the people we know are sacrificing too. It does burn me a little though to know our family clothing allowance probably wouldn’t pay for one of Sarah Palin’s designer clothing outfits. Even if Palin, as her campaign staffers say, will give all the clothes to charity after the election. If elected, will Palin continue her fashion assault. Will taxpayers pick up that tab? Is this just a dress rehearsal? I guess you’d call that a dressing down.